Yesterday, La Presse published a report on smaller parties. Amin Guidara offered a tour centred on an interview with Hans Mercier, a lawyer from Beauce who is also leader of Party 51, which pushes for Quebec’s annexation as the 51st state of the United States.1 The main article is followed by 16 paragraphs introducing the other parties in alphabetical order (except for the Green Party of Quebec, which inexplicably appears second…). As an organizer for a party that was once small, I’d like to offer a more nuanced picture emphasizing the organizational strengths of those parties that display some. Instead of starting with the list of 21 authorized political parties from the Chief Electoral Officer website, I downloaded the publicly available data about 2018 political contributions. I therefore ended up with a list of 18 parties, two of which are no longer authorized (the Parti union nationale and the Parti indépendantiste). Five authorized parties therefore haven’t received any contributions. To gain some historical perspective, I transcribed the dates of authorization found on the Chief Electoral Officer website as well as performances in the last general elections. Source: Screenshot of https://www.pvq.qc.ca/ taken on 28 August 2018. I’ve also added, for the parties for which such data exists, voting intentions according to Too Close To Call’s 27 August 2018 projection. parties that haven’t been around for more than six years. What I mostly see in this last category is a huge surprise. I’ll quickly go over the parties that don’t have seats at the National Assembly but that appear in polls. I’ll dig in deeper when we know exactly how many candidates they’re fielding. I’ve ordered them by the funds they’ve managed to raise since the beginning of 2018. You might notice that this variable seems to run counter to voting intentions. On the one hand, voting intentions change a lot relative to their score from one poll to the next. On the other hand, we see from the 2014 results that the Green Party fared better than the Conservative Party of Quebec with less candidates. We’ll take a closer look at voting intentions in later post. The Marxist-Leninist Party of Quebec (MLPQ) and the Bloc Pot have been fixtures of Quebec general elections since 1989 and 1998 respectively. With $5,800 in funding each since the beginning of the year, these parties are actually pretty close to the Green Party of Quebec. It however gathered ten times more votes by presenting only two to three times more candidates in 2014. The MLPQ are currently fielding 25 candidates and the Bloc Pot, 10 (with only one woman). They’re running in Montreal, on the South Shore, in the Laurentians, in and around Quebec City, and in the Outaouais. I’ve found in the new smaller parties an important surprise: the amount of fundraising achieved by the Citoyens au pouvoir du Québec party which, with its $10,000 since the beginning of the year, comes in 7th, in front of the Green Party. Visiting its website, it seems that the former party of controversial union leader Bernard “Rambo” Gauthier’s goal is to run 125 candidates. Indeed, it lists all 125 ridings in alphabetical order with either the name and photograph of the candidate or an image indicating that they’re looking for a candidate. 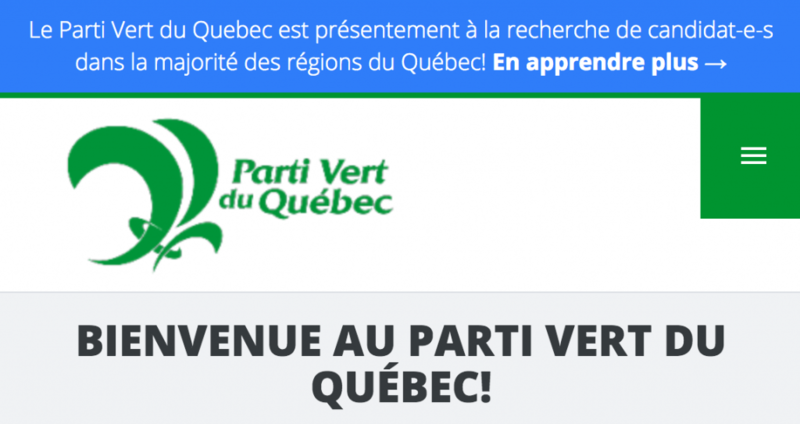 Source: Screenshot of https://www.citoyensaupouvoir.ca/vos-candidats taken on 28 August 2018. Advertising 48 candidates, the Citoyens au pouvoir party is already comfortably ahead of the older smaller parties: that number even places it between the number of candidates run by the Green Party and the Conservative Party in 2014. The Green Party and the Conservative Party are set to perform better this year, having already announced respectively 70 and 90 candidacies. NDP Quebec for its part seems to be having a slow start. Despite having the best fundraising amongst parties that have no seats at the National Assembly, they have only 31 candidates up on their website. Citoyens au pouvoir, a party to watch? The Citoyens au pouvoir party’s fundraising is 40% higher than that of the Green Party. It has already announced candidates in nearly 40% of ridings while NDP Quebec only has 25%. Why then aren’t pollsters including the Citoyens au pouvoir party when measuring voting intentions? Guidara, Amin. “Voter pour un Québec américain.” La Presse+ , 27 August 2018, Actualités section, screen 9. Giguère, Ugo. “Élections 2018: record de partis politiques autorisés en 45 ans.” La Presse . 30 July 2018. Research on contributors on 28 August 2018 at 7:32am. Too Close To Call ’s 27 August 2018 projection. Following the 1977 Act to govern the financing of political parties: the QLP was founded on the same day as Canada (1 July 1867). Following the 1977 Act to govern the financing of political parties: the PQ was founded on 11 October 1968. Because it merged with Option nationale: Quebec Solidaire was founded on 4 February 2006.